Alchemy, Virtual hybrid synth from Camel Audio. Camel Alchemy was fairly easy to install and setup. You need to set up an account with Camel and then download Alchemy plus all the presets and samples (5GB) - so it does take some time to install. Once it's installed and you're ready to go it's worth watching the tutorial videos as these are great, whether you're a novice or more experienced virtual synth user. There are 3 levels to Alchemy - Browse, Simple, Advanced. Browse allows you to browse through the existing presets. Simple allows simple manipulation and control over the presets and Advanced allows you create, control and manipulate samples to your hearts content. Having a few instances of Camel Alchemy running together can be a bit CPU intensive, especially if you are using several filters the arpeggiator, lots of effects etc but I don't normally get any issues until I'm at the mix stage, at which point I should have bounced down the midi files to wav. I really love Alchemy. There is so much it can do and it is so fun to use. Even if you're a novice it does not take long to start making and manipulating your own sounds and there is so much you can do with the sounds - LFOs, ADHR, Arpeggiator. You can map any of the parameters to pretty much whatever you like. For example you can set the volume to an LFO and then set the LFO speed to a second LFO. But really it's something you want to experiment with. There are lots of presets to get you started but I would definitely recommend importing your own samples or instruments and trying to make your own sounds. It's not hard to do and is a lot more rewarding, knowing that no one else is going to be using those sounds. There are a lot of alternatives to Camel Alchemy, Razor, Massive, Waves have a few synths out now, but I feel those synths are good for creating a certain sound that already exists (e.g. Massive is great for dub step) but Alchemy is something you can dive into and not know what you're going to come out with, but be confident that you can create something cool and unique in what feels like no time at all. The best thing about Camel Audio alchemy is how easy it is to use. Even if you really don’t have much experience in dealing with synths and plug ins you should still have no issue running Camel Audio alchemy right away. 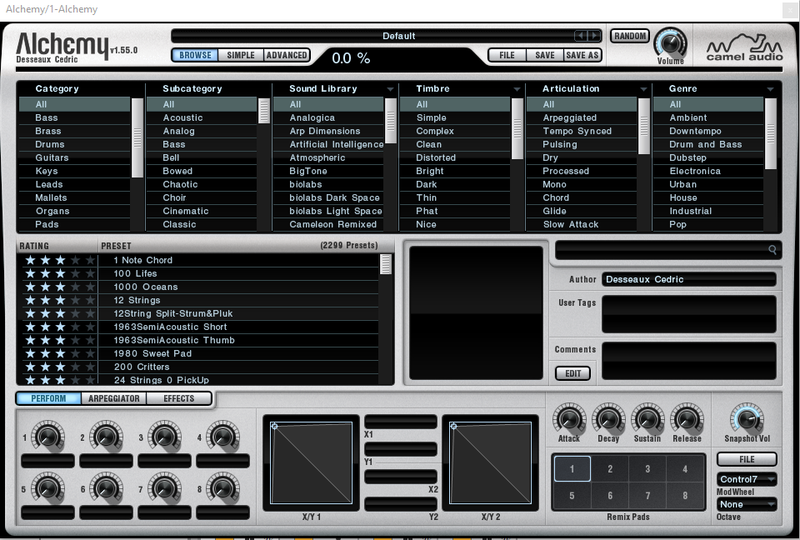 I love this hybrid vst and I use it a lot and will continue to use it. Im not sure how long it has actually been out, but I have been using it for around a year or so after a buddy of mine told me about it, if he never said anything about it I probably never would have even heard of this vst. Because Camel Audio doesn’t do any advertising of any kind on this software so no one really knows about it , which is great because that’s just more sounds and synths for me. This will give you state of the art synths that not every one has, I love when I find plug ins that no one else is really using because it allows me to have a new sound and something different to work with. Very easy to set up, installed very fast and quick. 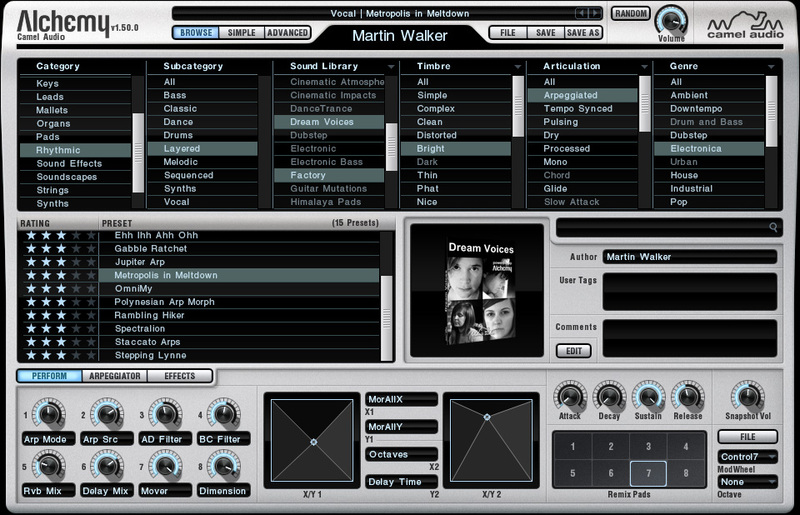 It can run in almost any of your sequencer programs or your daws that you might use. You can even run multiple instances of Camel Audio Alchemy at the same time and never have to worry about it crashing or getting glitch on your. I have used it on my laptop that’s not even really a good laptop. it’s a older XP laptop and it still works great. 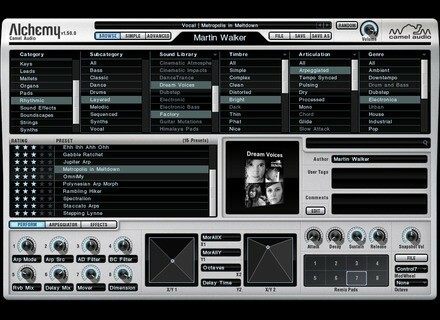 The price of this vst is very reasonable, and its very easy to do your programming of your sounds in it. Nothing is too difficult. Unless you have no idea how to use a synth vst plug in then you might have some small issues programming , but you wont have any issues using the actual vst. Its worth the buy! Tall Ced's review (This content has been automatically translated from French)" Ebourrifant!" If the installation is no problem, it can be very, very long though because you need to download and bugs found have been seen by more than one user. It took me several attempts to get the full downloads ... Get out your modules and banks ONE by ONE in the order suggested by the site! No incompatibilities encountered, I use it in its latest version on win 7 64bit with Ableton Live 9. Question manual, it is clear, it is in English and with a racing such, it is a regret for me that does not control enough technical English. But the FAQ section of the website and service tips will certainly help. Configuration: Asus Motherboard and I5 processor, 12 GB of ram, SSD + HDD for datas 1 terra map and TC Electronics Konnekt 8 firewire. Perfect hardware + software configuration, not CPU intensive and really stable, even with 10 tracks open twelve o'clock in the song. I, in the same genre, including attempted NI Absynth and Alchemy is more complete, more varied, easier to handle as well. I also use Reaktor and Kontakt and there is no picture of the possibilities and much clearer grip here. What I like most: the ability to test a fairly complete and unlimited free version. Then the banks varied themes, the possibilities of using my own samples, granular synthesis, midi learn easy as pie and stable. Finally, this monstrous beast opens endless possibilities as the system offers different modulations. What I like least: the quality of the proposed bank is uneven: the nine or ten purchased, there are two that I use only little basic state. The price / quality ratio seems really good, new banks come regularly but not too often. Once you begin to buy from them, they send you regular offers, discounts. A note is also buying you receive a very good assistance. Their service is fast and reliable. The guys are passionate and feel you are doing. With experience, I absolutely do this choice. I highly recommend it, especially as its free version and sounds offered feast with you already! Do not hesitate, try it! Eatyone's review (This content has been automatically translated from French)" I can not do without"
In short a must for me, I have mini 10 instances in each of my tracks. Camel Audio divides by two the price of its Alchemy virtual synth, lowers the price of some bundles and offers a didgeridoo in December.